I've been testing some SB 180 grain ogives recently. They are much cheaper than the Sierra's; but a word of warning! The weight of these varies considerably when compared to the Sierra's. So obviously some money saving in the quality control department! However they do shoot well if you grade them. I have been weighing them and batching them for loading. Out of the first 100 ogives, only 9 were bang on 180 grains. 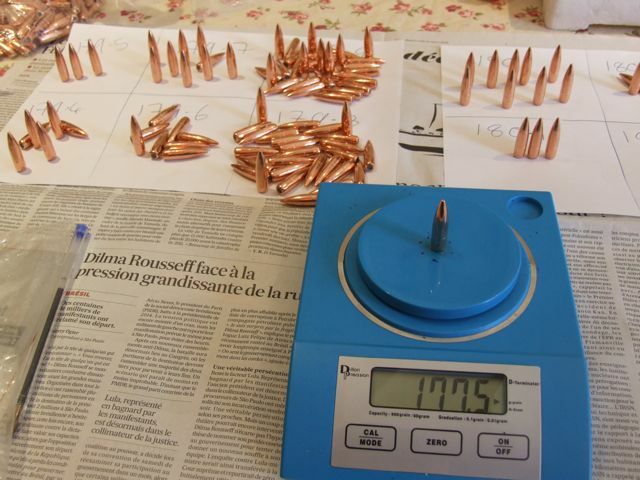 The majority were 179.9 or 179.8 grains; but the range is from 179.3gr to 180.gr with 1 worst at 177.5gr, thats 2.5 below spec. So basically you have to buy twice as many to get enough of one weight! which is where you'd be if you just got the Sierra's. I now have quite a few plinking rounds!!! That's a lot of variation. Just a quick word about scales. Mechanical scales get more accurate the longer the object is in the pan. Digital scales are only accurate for a few seconds once the full weight is added. The longer an object is on the scale, the more inaccurate it gets. Also remember to put your cell phone as far from the scale as possible. The same goes from other electrical devices that may affect the scale. I even read somewhere that LED's could affect a scale. Bullets do have variations in weight. Normally 1gr each way. This is normal. Monolithics tend to be better. SP are the worst. Keep those that are way out for fowlers. Group the rest and use in batches. It depends on how the digital scale is powered. Most of the problem comes from electrical "noise" in the system from other things attached to the main. (florescents are horrible for this). Its one big reason I stick to my old 9v battery powered scale. Another interesting experiment can be trying a group using the bullets with the most diverse weights. If this is done at short range, say 200 yards, there isn't actually that much difference in the group size when taking the human element into the equation.....as in, we can all pull the odd shot, and this in itself can produce a larger group than otherwise, so it is sometimes very hard for us to see the difference a grain in weight makes. Agreed that at the shorter ranges, the difference may be small. Probably more noticeable as the range gets longer. These are quite good in my rifles. I have a couple of competitions coming up soon; which are at 200 metres. I want regularity in the loads; so the only variable is me, then I can only blame myself if have a bad day! I don't have regular access to a 200 metre range (my local club is only 50 metres). It's a real problem in France, not enough ranges and we are not allowed just go down the fields and fire a few off!